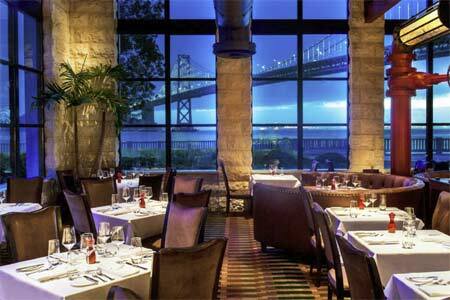 Big views, charm and steakhouse fare at this showstopper on the Embarcadero. : With its majestic bay views and high-end allure, this airy, buzzing restaurant is an oversize, dream-like interpretation of a turn-of-the-century pump house. Prodigious steamship components within the soaring dining room and second-floor bar are juxtaposed against vast windows framing Oldenburg’s “Cupid’s Span” and the iconic Bay Bridge. Yet the feel throughout is detailed and pampering, with beautifully appointed tabletops and polished, knowledgeable service. Executive chef and partner Parke Ulrich’s open-fire kitchen turns out decidedly improved-upon steakhouse standards. Dungeness crab cocktail and tuna tartare lead to grilled sea scallops and crispy maple-glazed pork belly. Prime dry-aged steaks prepared correctly and to order are accompanied by exceptional but unnecessary béarnaise, horseradish, chimichurri and house sauces. 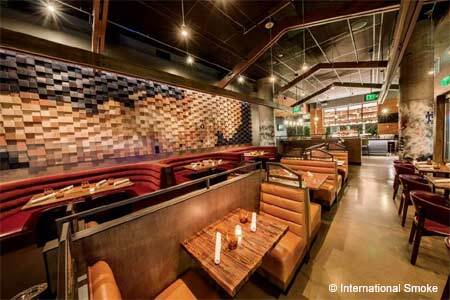 A deep wine list leans to California, and offers roughly 25 quality selections by the glass.